National Society of the Descendants of Textile Workers of America, Inc. 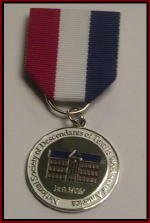 This insignia medal is available to all members of the National Society of Descendants of Textile Workers of America. You can wear this proudly, knowing that you are honoring your textile worker ancestor. All proceeds (including handling and postage) from the sale of this medal are placed in the dedicated scholarship fund. NSDTWA is a tax exempt 501(c)(3) organization. Donations to NSDTWA are tax deductible to the extent allowed you by law. Copyright © 2019 National Society of the Descendants of Textile Workers of America, Inc.